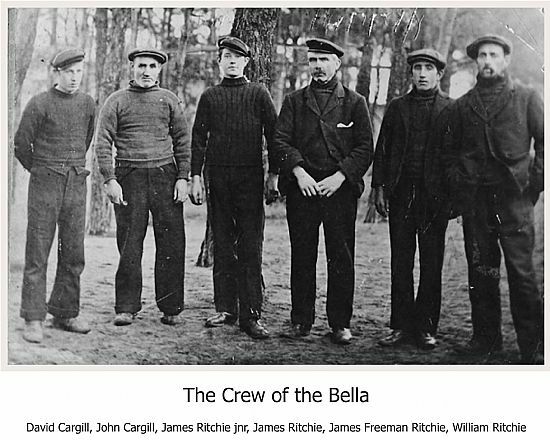 The Bella was a Fifie which was brought to Gourdon from Anstruther in 1912. According to the Maggie Law Database of ME Registered Boats she was registered at Montrose as ME235 in December 1912. The database records that she was 43' long, displaced 11 tons and her beam was 11' 6". She had no wheelhouse. Her yawl-rigged foresail was the main form of propulsion. An auxiliary motor was fitted in 1912 with fixed gears; forward and astern. She fished with lines and drift nets. Her owners were James, Alexander and Edward Ritchie. James Ritchie was her skipper. This photograph which was taken in Germany in 1916 was provided by William Cargill of Gourdon, son of David Cargill. Another copy of the same photo was contributed by Neil Ritchie. David Cargill: then aged 16, David died in 1941 in a tragic incident in Gourdon Harbour. The father of William Cargill of Gourdon, William was only four when his father died and is now (2018) 81. John Cargill: mate of the Bella, father of David Cargill and grandfather of the above William Cargill (Waldo). James Ritchie: also aged 16 at the time, James is the father of Neil Ritchie of Gourdon, now in his eighties. James Ritchie: Skipper, father of James Ritchie and grandfather of Neil Ritchie. On capture the crew were taken to Germany and for an account of their experiences there see the article by John Mathieson first printed in the Leopard Magazine of August 2012. More details of the capture and the subsequent imprisonment are given in the Mearns Leader article by Roy Souter. A pictorial record of life in the camp is provided by the set of four postcards which were sent from Germany and which carry the Brandenburg postmark. Thanks are due to Janice Duncan née Fairlie, of Port Glasgow for making these postcards and the picture of James Ritchie available to us. `Twas on a dark September morn the 'Bella' left the shore. Sailing through the foggy dawn as oft she'd done before. The crew was ready with their lines to earn their daily bread. They little thought that autumn day would fill their minds with dread. And saw through its periscope 'Bella' was easy prey. To see a German submarine rise before their eyes. And so they entered, one by one inside the U Boat's hold. The exploded wreck of the 'Bella' sank beneath the sea. Their treatment by the U Boat crew was always very fair. Their ration of the U Boat food was always a full share. To labour in a prison camp from early dawn till dark. That each and every one was safe, every man and boy. Till the 1918 Armistice brought them safely home. The memory of the prison camp fading slow away. To crew the Fifie,' Happy Return', 'Bella's' replacement boat. A number of people have willingly cooperated in contributing the information and photographs which make up this page. Celia Craig undertook the onerous task of collecting the contributions and particular thanks are due to Neil Ritchie, William Ritchie, Alan Donaldson and Vally Craig. Celia Craig has pointed out that certain points of detal given in the Leopard article by John Mathieson differ from the account given here. We believe our version to be correct.